The Edit button in the Spelling Dictionaries window displays the window (shown above) used to edit a custom spelling dictionaries entries. A custom spell check dictionary can have two types of entries: correct spellings and auto correct spellings. Correct spellings appear as a single word. "Google" in the picture above is an example of a correct spelling dictionary entry. When a word is entered in a custom dictionary as a correct spelling it will not be flagged as a misspelling when it appears in a document. Auto correct spellings appear as a word followed by a "»" character followed by a word or phrase. 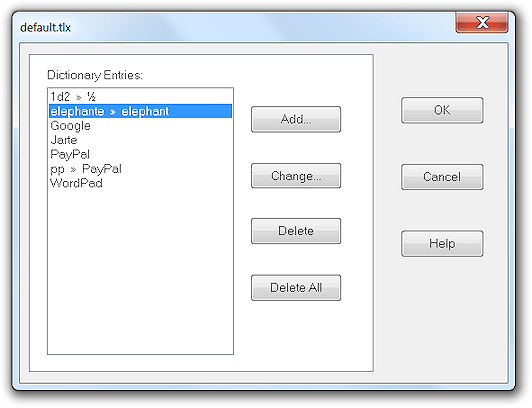 "elephante » elephant" in the picture above is an example of an auto correct spelling dictionary entry. Auto correct spellings are only used when Auto Correct is enabled. When a word you have typed into your document matches the first word in an auto correct spelling then it is automatically replaced with the word or phrase to the right of the "»". For example, the picture indicates typing the misspelling "elephante" into a document would result in the "elephante" being automatically replaced by "elephant". Auto correct spelling entries can also be abbreviations used to increase typing speed. For example, in the picture above, the "pp" entry specifies that it is to be auto corrected to "PayPal". Note the word "PayPal" also appears as a correct spelling entry to ensure it is not flagged as a misspelling. Clicking the Add or Change button causes the Spelling Dictionary Word window to appear which allows a correct spelling or an auto correct spelling to be added or changed in the dictionary. The Delete button deletes the currently selected entry from the dictionary, and the Delete All button is used to delete all entries from the dictionary.